Blackness. The Void. Empty Distances. 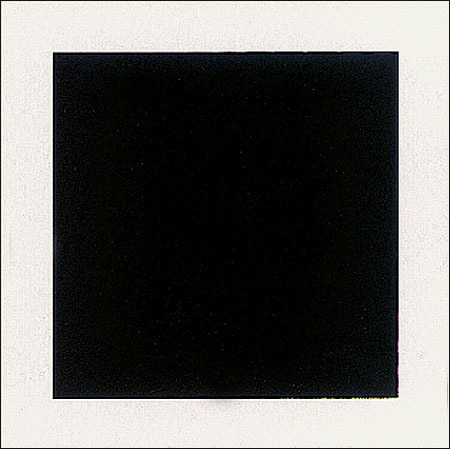 Out of the darkness, the void emerged and invaded modern art with Russian artist Kazimir Malevich’s painting Black Square in 1915. As the totalization of everything and nothing at once, this landmark painting is infinite space represented on a flat plane. A undefinable negation that is at once cinematic and static, it is not a representation of the void but the void itself. A reduction of form and content to an absolute essence, Black Square conveys a simultaneous flattening and infinite expansion of space. Just as when the screen goes dark in the cinema, representations of distance are made palpable. There is horror within this unknown space. It is an empty distance. It has almost become a special art to paint empty space, to make it palpable, and to develop variations upon this singular theme. Not only are there pictures upon which almost nothing is painted, not only is it an essential feature of their style to make the strongest impression with the fewest strokes and the scantiest means, but there are very many pictures especially connected with a contemplation to impress upon the observer the feeling that the void itself is depicted as a subject, it is indeed the main subject of the picture…. Nearly one hundred years after Black Square and Otto’s The Idea of the Holy, the void takes on new meaning in contemporary art and film. While Empty Distances stems from art historical traditions of emptiness as subject (think Yves Klein’s La spécialisation de la sensibilité à l’état matière première en sensibilité picturale stabilisée, Le Vide in 1958 or Michael Asher’s wall removal at Claire Copley Gallery in 1974), philosophically this exhibition is a provocation to rethink the void’s meaning by considering it in post-apocalyptic terms. Taking 20th century theologian Rudolph Otto’s phrase “empty distance” and idea that the very act of pictorially depicting the void establishes darkness and silence as subject itself, Empty Distances positions itself at the collapse of society. The recent global financial crisis, governmental overthrows in Egypt and Libya, and the current protests in Istanbul’s Taksim Square (violent repercussions of human-produced horrors) have taken us to the other side; we are living in a post-apocalypse. But within this cyclical fall and rise of society is the promise a new future or, at the very least, an imagining of a different future that is both dependent and secluded from the past. Films like Night of the Living Dead (1968) and The Bed Sitting Room (1969) along with artworks like those in Empty Distances are able to provide unthinkable visualizations of what a new society would look like and, in context with current international events, suggest that we may already be living in a brave new world, only we don’t realize it yet. Similarly, Eugene Thacker challenges a horrifying consideration of the spectral and speculative “world-without-us” in his book In the Dust of this Planet: Horror of Philosophy Vol. 1. Empty Distances takes Thacker’s provocation to task, arguing that through artistic representation we can imagine this horrifying and unthinkable realm devoid of humans (due to the cataclysmic fault of man, a world that either pre-dates man, or as a realm that exists independently of man) where the planet continues on its path of existence alone. Importantly, the attempt to reveal this void involves a spatial collapse and this is the where empty distances emerge. Through the influences of Black Metal, horror films, science fiction, scientific research, and magic realism, the artworks in Empty Distances connote a surface negative while implying infinite vastness. They provoke such diverse imaginings of a post-apocalyptic world through the depiction of the void, pulling the viewer into a speculative new world. Appropriately, this exhibition coincides with the presentation of a new video work by Josh Azzarella, Untitled #160 (Balcombe), in which he has reconstructed F.W. Murnau’s seminal silent film Nosferatu (1922) by eliminating all (un)human figures. 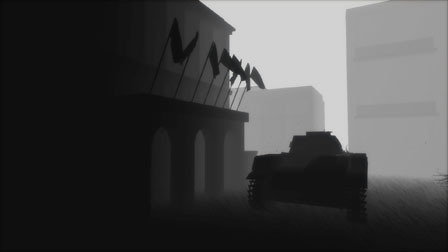 Architecture looms more prominently than before, doors mysteriously function on their own, the gloomy atmosphere spreads more ominously, blank spaces replace title cards. Here, through this mining of culture and our collective reference to it, Azzarella establishes a precise example of what a rendering of a “world without us” or empty distance can look like. Our relation to the memory of what was there (Meena and Jonathan Harker, Renfield, the Vampire) is entirely dependent upon a successful reading of the new and very different environment. It’s a reconfiguration of a continuously self-reflexive undying narrative of the vampire, specifically the transformative character of Dracula, repeated and recycled and transformed in its literary and cinematic forms. Untitled #160 (Balcombe) constructs a new language of absence through its ghostly presence. Through that we are able to position ourselves in a very strange, yet familiar, landscape; one that does not include us. The sudden changing world is reflected in Darren Banks’ series of BLOB drawings that cull from the film The Blob (the 1958 and 1988 version) in which an amorphous being from another planet crash-lands on Earth and begins to consume everything in its path. This blob is itself a void; an organic being that exists but has no shape, no beginning and no end. And it poses a certain problem for those who want to destroy it in order to revert back to normal: it cannot be stopped. Through video works, installations, and drawings, Banks’ work constitutes a sculptural language that culminates directly from horror, the domestic, science fiction, defunct technologies, creation and the unknown. 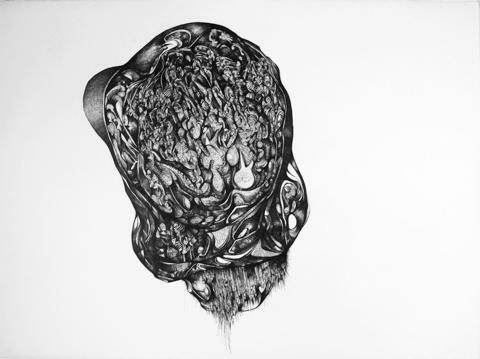 His intricate drawings in his BLOB series stem from a long cinematic tradition of representational mists, black clouds, and ooze invading the Earth and consuming human life. The Blob shares similarity with the quintessential BBC television program from the late 1950s called The Quatermass Experiment where a manned spaceship returns to Earth with all but one man dead except, naturally, something is quite wrong with him. A new hybrid, part man and part alien, he becomes an organic vegetative mass that continuously kills and consumes. The endings of both The Blob and The Quatermass Experiment are as ambiguous as the forms themselves; is this the end or the beginning? By formalizing this formless entity in a visual medium, as an object floating in a negative space, Darren Banks reveals to us this hidden parallel world in a very Lovecraftian manner. H.P. Lovecraft, the literary master of the unknown, revealed real and unreal horrors through suggestion rather than overt description. His stories express the chilling belief that there is only a sliver of a barrier between ours and another world. Ancient or future, this liminal space reflected in stories such as The Beyond (What do we know,” he had said, “of the world and the universe about us? Our means of receiving impressions are absurdly few, and our notions of surrounding objects are infinitely narrow”) suggest that unknown horrors lurk just beneath our everyday surface. It’s a tantalizing gesture for Lovecraft and Banks to make aware that these monsters can creep into our reality at a moment’s notice. The short animated film Z by Alan Warburton doesn’t so much reveal a hidden world as explicitly show a post-human existence. By making the familiar barren and strange, Warburton involves the audience in asking how we make sense of the clutter of current events, how we create epochs, and how, in an era of intense global change, we are affected by a kind of long-term myopia that obscures us to the larger forces at work. Z makes visible Eugene Thacker’s “world-without-us” as it forces a look at the big picture…and it may not include us. Composed entirely of z-depth images (also known as “luminance depth” or “depth map” images), Z is a ghostly black & white data-driven format native only to CG animation. Aesthetically, the z-depth image is beautiful and alien: when animated, it gradually reveals objects only when they pass through a certain scene depth, abstracting and clarifying simultaneously. Here, format itself is the empty distance, a digital rendering of the world-without-us. And as the camera sweeps through the urban and pastoral English landscape, reminiscent of the British film 28 Days Later where the protagonist roamed the shockingly abandoned streets of London, we have a privileged vantage point bearing witness to this apocalypse. But we are not a part of it; removed and surveyed at a distance, we experience this new world from afar. Commissioned by Channel 4 and Animate Projects in the UK, Z was initially intended to play on our televisions sets. By placing this vast and empty environment within the domestic space (it’s inside our homes! ), the very horror of what happens at the end of the world is conflated with our current reality. It’s a domestic invasion that makes the ontological a technical vision. Recalling the “z” in zombie, this immediate dependency on television and the apocalyptic experience is omniscient in the zombie film. A tv is a prominent fixture in the room and a source of news for the small group of people trapped in a farmhouse in George A. Romero’s Night of the Living Dead while its sequel, Dawn of the Dead, begins in a newsroom and continuously shows religious prophecies and political debates played out on the small screen. The convergence of the outside world events into our living rooms (and our laptops) makes the “other” extremely personal; the ghost in the machine is us. To all Estates, inevitable Losses! Comets are what is left over from the formation of stars and planets billions of years ago. A temporary atmosphere, they are a spectre of our collective past that has haunted mankind for centuries and have been observed and recorded since ancient times. The very essence of duality, comets are incredibly distant but visibly present, containers of past beliefs and promises of new discoveries, representative of life beginnings and pending extinction. They collapse the space between our past and our future while also placing divination and the scientific on the same plane. Mystic and scientific at once, comets are an empty distance. Historically, comets have been viewed as a prophetic symbol that foretold the future (catastrophe, messiahs, end of days) while contemporary thought is that comets are capsules of information about the formation of our solar system (i.e. the very basis of life). 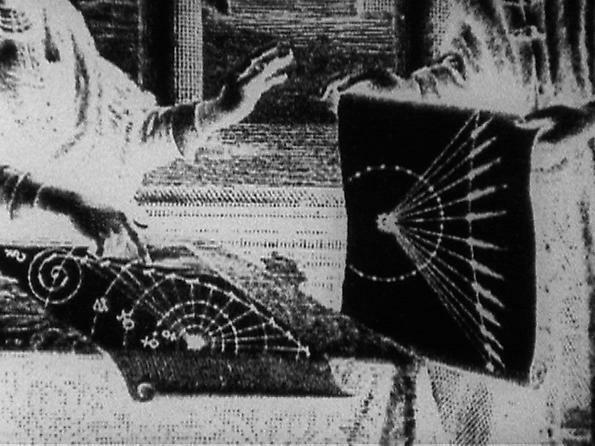 Deborah Stratman’s These Blazeing Starrs… positions these two viewpoints together in film that combines imagery from 15th-18th century broadsides with NASA Jet Propulsion Laboratory footage, suggesting that comets are oracles of this future/past. In black-and-white (shot in 16mm), the juxtaposition of these beautifully hand-drawn research documents and the photographic footage of recent years nearly abstracts what it is we are looking at. The comet simultaneously becomes mythologized and discovered, an object of fear and beauty. Cinema has become the perfect medium to obsess over these catastrophic horrors at a safe distance. The representation of comets in the disaster film have become staples in popular culture cinema. The very notion of extinction, as much as we’re able to conceive of it, comes from heroic movies like Meteor (1979), Armageddon (1998), and Deep Impact (1998) or a global post-apocalyptic films like Night of the Comet (1984). These movies visualize the unthinkable, the end of the world becomes a means to working through current ideologies. And by perpetuating the idea that comets are arbiters of doom rather than keyholders to our origins, these films instil a fearful look at what space, the ultimate beyond, has in store for us. Imbued with these references, Stratman’s utilizes the historical, scientific, and cultural relations to comets in These Blazeing Starrs... to emphasize the connection and disconnection we have to the universe. Having a connection (and inevitable disconnect) to the universe is explored in James Aldridge’s paintings, works-on-paper and sculpture. Addressing themes around knowledge, belief, good and evil, Aldridge is positioned amongst a new wave of philosophical thinking called “Black Metal Theory”. Much more than a musical genre, black metal has become an attitude and situated itself as a mode of thought. The term “mutual blackening” used frequently in Black Metal Theory means to suggest that the two, black metal and theory, are separate entities that must open up to each other to engage in a new speculative discourse. Music, literature, art, film and philosophical have all emerged from this blackness to process the world around us through darkness. At the core of Aldridge’s practice is a concern over the belief in images; focusing on how we relate to imagery concerning nature, folklore, and the superstitions that how these our reading of these visual constructions is affective. This concern is manifested in the frequent representation of the raven in his works, a subject of mythology that is often viewed as spiritual or, sometimes, even a god. Edgar Allen Poe’s classic poem The Raven (1845) and the films it has inspired, depict the raven as evil prophet of death: “Prophet!” said I, “thing of evil-prophet still, if bird or devil! But the raven also suggests possibility and it’s in the implication of how nature’s symbolism permeates throughout literature, film, and art that clearly indicates the frequency in which our experiences with nature are mediated, myths perpetuated. Nevermore. There is a psychological tension reflected in Aldridge’s work where the depicted landscapes and environments suggest both a strength and a vulnerability in our tenuous relationship to them. 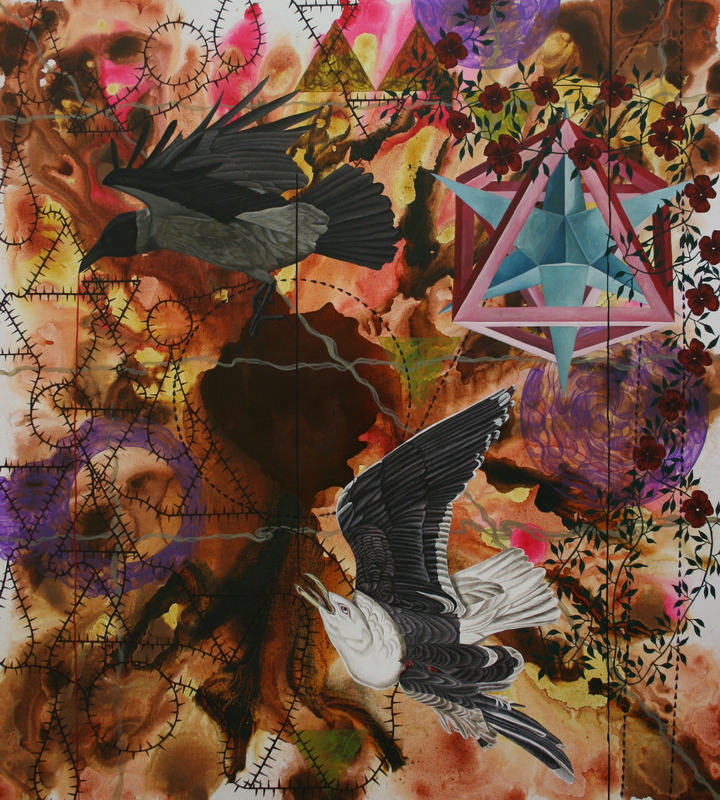 The chaos erupts vibrantly through a flattened plane, where a mix of organic (birds, flora, deer) merge with geometric patterns and forms in a formless space. 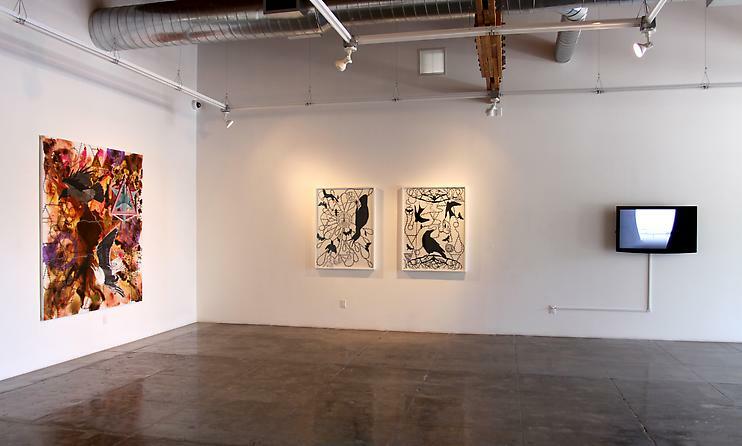 While his paintings are an explosion in vibrant color, an aesthetic power of imagery that is seductive and terrifying, the black-and-white paper cut-outs reflect a shadowy gothic other world. Here the void is less about an actual blackness but an implied conceptualization of what “blackness” entails. In that implied extinction, violence, and disassociation, Aldridge’s work convey an empty distance. 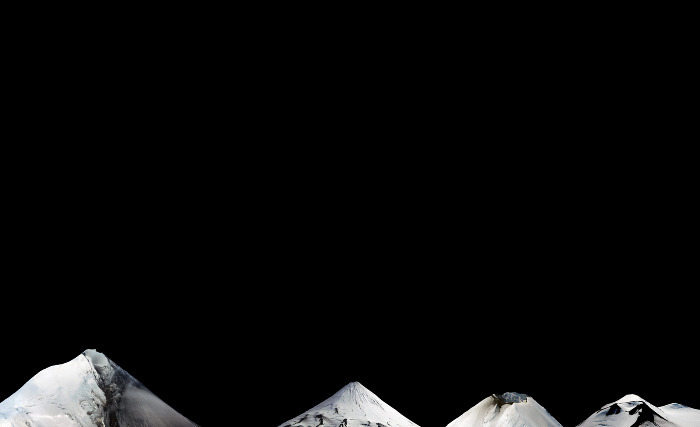 Explosions in the sky, murky canal ways, mountain peaks in the vast darkness; Sean Higgins’ work (sourced from photography but sculptural by nature) depicts static moments existing somewhere in between calm stasis or a state of crisis. Negative space envelops these post-apocalyptic realms, these hermetic spaces of unknown origins. There are no humans, no life. With Higgins’s works, space itself is collapse in a frozen state of here versus there, going nowhere and heading out into infinite beyond. As with the other artworks in this exhibition, we cannot think of the negative as nothing. Instead, it becomes a space that is, itself, occupied by an un-qualitative presence. With their collapsed spaces and pools of endless blackness, hovering between the technological and the natural, these works are flat and infinite. Naming the artwork’s titles after Joy Division albums (Unknown Pleasures and Closer) make reference to an introspective language that connotes disconnection, alienation, longing, history and death. Through this positioning of time and space within one image frame, an empty distance becomes a snapshot, a static image that represents the whole and one where we fill in the preceding and concluding actions. Dark and gloomy beautiful surfaces, Higgins’ works embody the provocation proposed in Empty Distances – how do artists reflect the post-apocalyptic world through the void? Few television programs have dared to represent the potential ramifications of humanity’s actions or reveal to us the unthinkable than Rod Serling’s revolutionary The Twilight Zone (1959-1963). The Twilight Zone showed television viewers the world (and human nature) as it had never been seen before. The Twilight Zone came forth out of the liminal boundary between our existence and a proposed parallel universe to serve as a warning for these imagine futures. Horrifyingly, it remains unmatched it its complex and frightening cautionary tales of the nuclear bomb, human interaction, scientific and technological dependence, violence of war, and alien invasion. The ability that these entertaining and moralizing apocalyptic visions from The Twilight Zone have to provoke thought means that they succeed in making social-political commentary through the subversion of our human condition. Even entering the “twilight zone” (aka the fourth dimension) implies that Lovecraftian suggestion that there is another level of existence collapsed into our current reality. This irruption in time and space makes any boundaries between the here-and-now blurred. In fact the very existence of the “twilight zone” is an non-place. It’s an empty distance. When Eugene Thacker says that “horror is the paradoxical thought of the unthinkable” we know this to be true because our experience of horror and the unknown is entirely dependent upon hypothesized representations in the gallery space, the cinematic space, in books and on our television screens. The very idea of trying to visualize, conceptualize, and process the end of the world is problematic; by the very nature of us not being there to witness it, we have zero notion of what the world without us would look like. So we grapple with ideas of the possible, the inevitable, and the apocalypse through artistic visions found in Empty Distances. Death, god, planetary devastation; the unknowable made tangible, if not fictional, through artistic intervention. And it’s the utilization of the void and all matters of darkness that bring forth the most vibrant apocalyptic visions. Within these empty distances, at once so close and so far from home, the unthinkable is made possible before our very eyes.